> McAfee > Discover. Evaluate. Act. Reduce Risk With Real-Time Identification, Assessment, and Response. Up until now, your view of risk while monitoring your network has been incomplete. 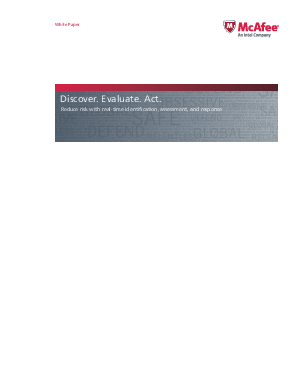 This white paper discusses a new, innovative approach to protecting your network through a combination of active and passive network discovery and monitoring, in real-time. Now new devices added to the network can be detected immediately so that any compliance or operational policy violations are visible right away shifting the vulnerability management model from periodic scanning to real-time monitoring to increase your visibility and you can't protect what you can't see.